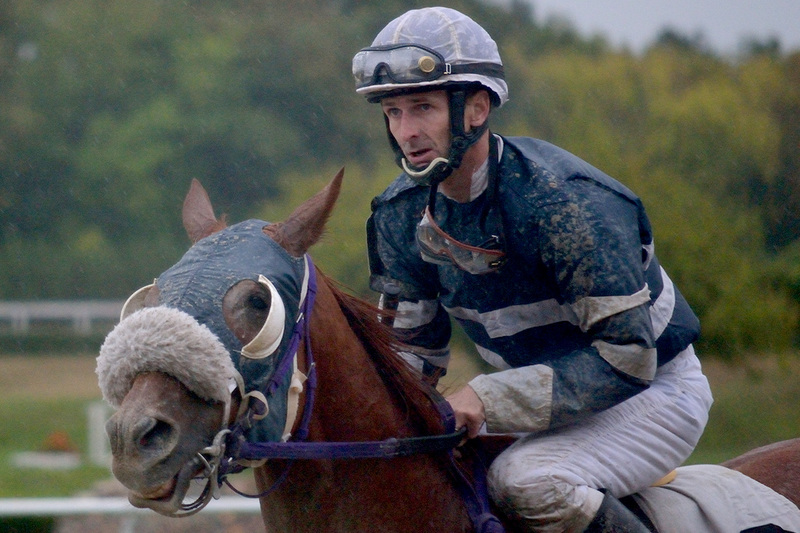 Bo Badger and Taylor Hole gallop back after winning the last race at Suffolk Downs on October 4, 2014. More photos from closing day at the track. “They should have been here two years ago,” said trainer Kevin McCarthy, looking over the Suffolk Downs paddock fence at a crowd that pressed three deep despite the rain that began minutes before the final race on Saturday. Twelve starters were entered, including McCarthy’s horse, Indy’s Illusion, a 4-year-old A.P. Indy colt who finished ninth in the 2013 Florida Derby. “We’ll be here,” “next year” — the phrases kept coming up in conversation. Paul Umbrello of Charles River Racing, an owner and another new NEHBPA board member, wore an electric blue t-shirt with the injunction, “Keep Calm and Save Suffolk Downs / Vote NO on Question 3,” a reference to the casino repeal measure on this November’s ballot. “We’ll be here,” he said, and talked about the NEHBPA’s effort to put together a plan for leasing the track. The last race was a mile and 70 yards, and the horses went into the gate in front of the grandstand. The bell rang, and the crowd cheered, and a minute later, the field was in the stretch, Bo Badger and Indy’s Illusion in front, dueling to the wire, trading head bobs to the end. The photo sign was lit. They galloped back and circled near the finish line, waiting. Glowing bright in the gloom, the “OFFICIAL” light of the toteboard switched on: #2 was first, #12 was second, and there was a dead heat for third. Bo Badger, owned by Eighth Note Stable and trained by John and Kathy Botty, would be the last winner at Suffolk Downs. He paid $21.80, and the crowd applauded as the winner’s circle photo was taken. When it was done and the horse unsaddled, Kathy rushed toward Taylor Hole, the last winning jockey, with a teary face and clasped him to her. “Thank you, thank you,” she said.